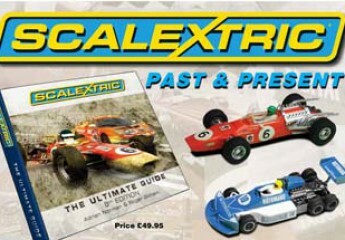 BUY ‘SCALEXTRIC ULTIMATE GUIDE 8th Edition’ HERE FROM PENDLE SLOT RACING OR SCALE MODELS. BACK IN PRINT! The “Scalextric – The Ultimate Guide, 8th edition” NOW AVAILABLE. Over 700 pages. Now with a ‘Collectors check box’ feature in the also new Gallery section. This book is a complete history of Scalextric. The business history, the products, the events, the competition history, the evolution and development, complete inventory listings of Sets, Cars, Accessories, Track, etc., etc. If you need to know ANYTHING about the history of Scalextric from the 1950s up until 2015 then this is THE book for you.